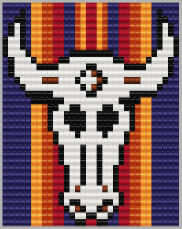 Colorful cow skull and desert colors will bring the South West to any design. Pattern for both front and back are included. Create with Delica beads for the best uniformity of pattern. Created by Sarah Davis of Beadcoop and Sarah's Beading Obsession.